Copying is slavery, you have to reach the spirit. You are a child of God. Your playing small does not serve the world. There is nothing enlightening about shrinking, so that other people won’t feel insecure around you. We are born to make manifest the glory of God that is within us. It is not just in some of us; it is in everyone. And as we let our light shine, we unconsciously give other people permission to do the same. As we are liberated from our own fear, our presence automatically liberates others. 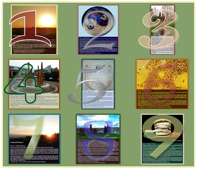 ▪ Our lives are interwoven with numbers and numerical values. ▪ Our existence is based upon the chemical elements. ▪ Patterns exist within the chemical elements and in our lives. Copyright © 2010-2019 SUM UNIVERSAL® • Ute Sonja Medley. All rights reserved.